Born in the Bouches-du-Rhône, in the south of France, Chef Guillaume Sinden has a Professional Baccalaureate in the restaurant sector, a qualification in restaurant pastry and a “Brevet des Techniques et des Métiers (BTM)” in pastry. Chef Sinden began his career as cuisine Chef at l’Escale restaurant in a unique location on the seafront in Marseille. To perfect his pastry techniques and broaden his culinary horizons, Chef Sinden left the south of France, choosing the Paris region to complete his professional training. He was taken on by the one Michelin-starred Ritz, in the role of pastry apprentice under the leadership of Michel Roth, “One of the Best Craftsmen in France (Meilleur Ouvrier de France - MOF)” Cuisine. In October 2004, he began working as a pastry Chef at the famous Ladurée pastry shop. Following two years in Paris and one year in Brussels,working alongside renowned chefs, Chef Sinden decided to return to his homeland in the South of France. For 6 years, Guillaume Sinden continued to develop his culinary career and pastry talent in a number of prestigious restaurants on the Côte d’Azur. Initially as Chef de partie at the one Michelin starred Les Pécheurs restaurant, before moving onto the one Michelin-starred Grand Hôtel Park 45 in the same role. In his aim to achieve professional excellence, he continued to climb the ladder and became pastry Chef at the Réserve de Nice in 2011, before moving to the Relais & Château Le Mas de Pierre located in a countryside setting in Saint-Paul-de-Vence. 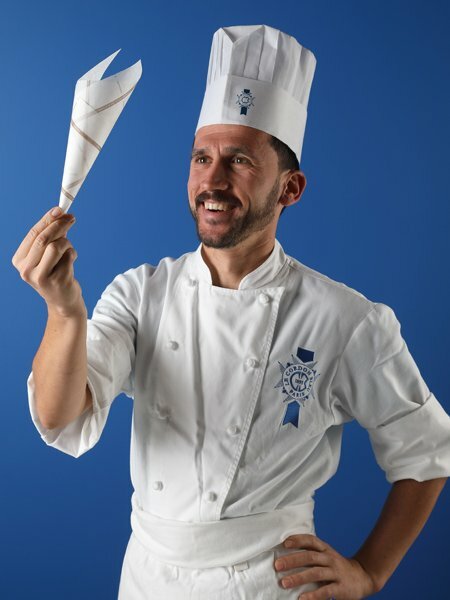 Chef Guillaume Sinden joined Le Cordon Bleu Paris team of Chef Instructors in 2016.